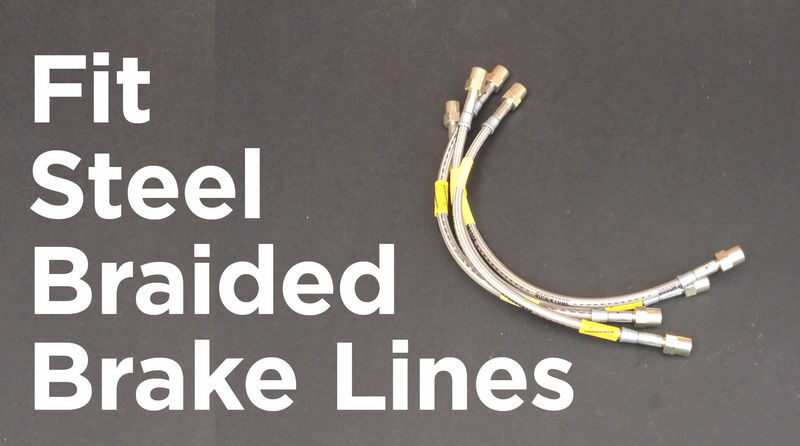 This is my step by step guide on how to replace your standard rubber brake hoses with steel braided ones. 2. This can get quite messy so put down a cloth or drain pan to catch brake fluid drips. 3. You may not need this but generally the brake hose nuts can be stuck quite tight. A generous spray of penetrating fluid will give you a fighting chance. 4. Now loosen the nut holding the top of the brake hose. You must use a flare spanner here otherwise you will round the nut. If it refuses to move try move penetrating fluid and come back in 10 minutes. 5. One trick you can do for more leverage on the nut is to join two spanners together. 6. Be aware the metal brake lines these hoses connect to are quite weak so you must be careful when loosening the nuts that you are actually undoing the nut and not twisting the metal line. 7. Once loose gently tighten back up to avoid brake fluid dripping out. Remember, brake fluid damages paint so wipe off any spillages. 8. For the bottom nut you’ll find the holding bracket is too weak and will bend if you try to loosen the nut. Usually you would use another spanner to hold the brake hose but Porsche hose ends are rectangular. To get round this use vice grips to hold the hose whilst you loosen the nut. 9. Clamp the hose to stop fluid leaking out and then remove the bottom part of the hose. Tuck it out of the way. 10. Now fit the new braided hose to the bottom brake line. Don’t tighten it hard just yet. 11. Now remove the top part of the hose and set it aside. 12. Connect up the top part of the new hose. 13. Now using an open spanner and a flare spanner you can tighten up both the top and bottom nuts. 14. On the front wheels turn the steering wheel slowly from lock to lock and check the new hoses don’t get stretched or snagged. 15. Repeat on the remaining wheels. 17. One disadvantage of the new braided hoses is that they cannot be clamped as they will get damaged so it’s useful to keep original rubber hoses if you need to do maintenance work on the brake calipers in the future.